The former President of the Shipowners Association of Nigeria (SOAN), Engr. 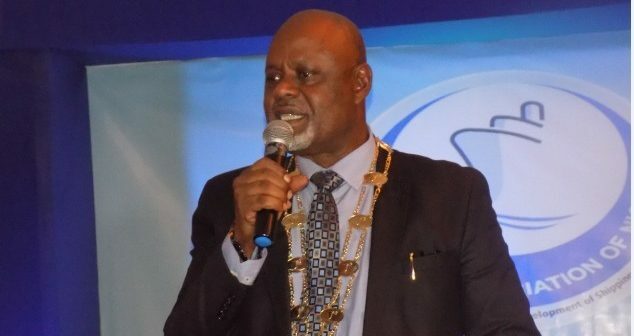 Greg Ogbeifun has said that the most challenging time for him as the President of the association was the period when his contemporaries in the association wanted him to continue as the President of SOAN after he had done his mandatory two terms of two years each allowed by the constitution. Ogbeifun who made this known while fielding questions from the media on the sidelines of the inauguration of the new executive of the association in Lagos last Friday stated that the temptation was to say yes because the ovation was high and the people appreciated his leadership. He said,” When you find yourself in a privileged position, even with all the challenges with the privileged position and God helps you to make a success of the vision and the ovation is loud, the natural temptation that the statuesque remain is high and that was the situation I found myself in after four years of hard work, thanks to the media who were always there to urge us on for the birthed baby SOAN to remain strong despite all adversities and challenges. “The ovation began to come, we all got carried away by the euphoria of the apparent success of the establishment of the institution, SOAN, to the extent that a group got together to say that I have to continue with the good work that I am doing. Everywhere I went, people clustered around to say, it is a good thing, every time in the news, my name, in the television, my person, in the press my photograph. “On top of it, the people who are your contemporaries in the association said, look, you must continue. That was the most challenging time for me, the temptation was to say yes, the ovation is high, people appreciate, let me stay put. But I remember that there was an important instrument of office that has to be respected and that is the constitution of the association. So, I picked the constitution, I looked at it, the constitution says a maximum of two terms of two years each and I have done two terms of two years and I said to myself, I didn’t matter the ovation, it didn’t matter the milestones, it didn’t matter the successes, it didn’t matter the accolades, the encouragements, the desires, the constitution has to be sacrosanct. “So, I took my pen, maybe I should now release that document to you people and I wrote a one page article to all members of the association thanking them for their recognition and then appealing to them that the constitution stands far above all our emotions, all our successes, all our desire and I titled that paper “Respect for the Sanctity of the SOAN Constitution”. It was when they saw that paper that God breathed on all of us to see that the best thing to do was to let SOAN metamorphose into a higher SOAN and there we came about this election”. Ogbeifun who is also the Chairman/Chief Executive of Starzs Investment Limited however admitted that they all had different opinion about who they thought should emerge as the new President but he said to everybody that it didn’t matter who emerged as all of them had a responsibility to rally round that person, to rally round that executive to help them succeed because “it is not about any position or about anybody anymore, it is about the association, it is about the industry and it is about the country as whole and that is what we are set out to achieve”. While expressing his joy for the successful change of baton within the association, he added,” I am a very fulfilled man, I have said it that I will use all my being to continue to work for the growth and the success of the shipowners association”.